Wearable technology is the new frontier for mobile design and development. And as with most other tech revolutions, this one happened quickly. Public interest in wearables like the Apple watch, FitBit, and Google Glass increased by 190% from 2013 to 2014, and analysts predict that sales will go from $2.5 billion to $30 billion by 2018. This comes at a time when technology is more personal than ever. 82% of wearable tech consumers believe that wearables have enhanced their lives through convenience and connectivity. So if you’re at all involved with digital product development, you need to consider the implications of this new craze on your digital strategy. How are customers interacting with your brand on these new devices, and how is your brand helping to enhance their lives? Wearable tech focuses less on the visual and more on sound and touch, so that experiences feel intuitive and the device is nearly an extension of ourselves. Voice-recognition is a good way to get around lengthy user processes or typing, and is being used by market leaders like Google Glass (just say, “OK, Glass!” to awaken the operating system, and blink twice to take a picture). In this same vein, FitBit has an alarm feature that gently vibrates on your wrist when it’s time to wake up. How will you customize user experience based on where a user is located? Personalized notifications for devices like Apple Watch, Google Glass, and Pebble are based on geographic data and biometrics. For example, a new Apple Watch app from BMW shows you a map of where you parked and the new Pinterest app sends push notifications when it senses you’re close to something you’ve pinned. Wearable tech adopters want to be better equipped to navigate the world on-the-go. How can your product or service help them do that? As wearables blend into our lives and become more discrete and closely tied to fashion, simplistic design will be key to creating a flawless UX strategy. Smaller screen sizes mean that you are going to have to pick and choose how and when you display information, based on user intent and any other available data. A tight integration with mobile will enable users to preview “urgent” information on their wearable device, and then consume the rest of the information later or as-needed. For example, a Fitbit might only tell you how many steps you’ve taken on its tiny screen, but when you log on to the app on your mobile phone it will tell you much more than that (sleep cycles, heart rate, etc.). 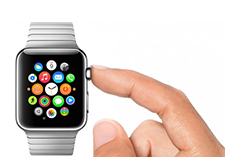 If you need help translating your digital strategy to the future of wearable technology, Celerity can help. Our Digital Experience and Enterprise Technology teams have extensive experience developing mobile solutions that utilize the latest technology from Apple, Google, and Microsoft.